It has never been easy to be poor and a child. This was no less true in Boston’s North End at the end of the 19th century, when the streets teemed with dangerous traffic and open space could feel practically non-existent. 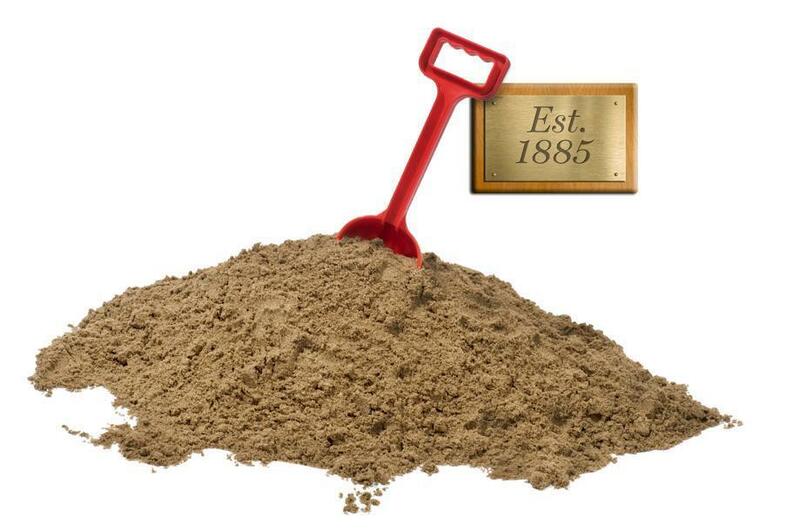 The plight of the neighborhood’s immigrant families touched the city’s philanthropic types, and in 1885, one charitable group decided to offer something of an experiment to the local children: a pile of sand, deposited for the summer in the yard of a chapel on Parmenter Street. Little did any of them know how much it would change the experience of childhood in America. Today, playgrounds look nothing like that simple sandpile. Over the next century, playgrounds were filled in with dangerous but thrilling monkey bars, swings, see-saws, and metal carousels, all on beds of dirt or asphalt. Then, starting in the 1980s, a new trend began, in which these sometimes rusty and risky structures were replaced by standardized plastic structures, the asphalt giving way to rubber matting. In looking for inspiration for the next generation of playgrounds, experts are starting to hark back to the messy, anarchic spirit of those earliest playgrounds of Boston. Their concerns may be prompted by a new set of problems—notably, the way that more protective parents and more sedentary entertainment have combined to quash the rambunctiousness and risk-taking once synonymous with American childhood. But as solutions to our 21st-century dilemmas of child-rearing emerge, the thinking of those earliest playground planners is starting to seem more prescient than they could have known. Children have always played, but they have not always had playgrounds. As cities expanded rapidly in the 19th century, experts began to worry about urban children growing up without opportunities for play and vigorous exercise. Friedrich Froebel, the influential 19th-century German educator who developed the idea of kindergarten, called play “the highest phase of child development,” and, starting around the 1830s, designed elaborate settings in which children interacted with animals, insects, plants, and running water. When the German-born founder of a Boston hospital for women and children, Dr. Maria Zakrzewska, visited a public sandpile on a trip to Berlin, she urged the Massachusetts Emergency and Hygiene Association, a charitable group whose main focus was to offer lectures on public health, to import the concept. By the summer of 1886, there were three sand gardens in the city; the following year, there were 10, mostly in tenement house courtyards. A 10-acre “outdoor gymnasium,” with swing, see-saws, and sand, opened in the West End in 1889. In Mayor Quincy’s 1897 inaugural address, he declared that every ward in Boston should have a playground. The next year, the city allocated up to $200,000 a year for that purpose, and by the end of the century, Boston had 21 sand gardens and playgrounds. It was the birth of what became known as the playground movement. The nascent movement began to spread. In 1906, the Playground Association of America held its first meeting in Washington, D.C., with President Roosevelt its honorary president. The playground had become an urban institution, and it was thriving in suburbs and small towns, too. Playgrounds grew to embrace flights of artistic fancy, such as sculptor Isamu Noguchi’s “playscape” in Atlanta. In retrospect, those were the good old days—at least as far as adventure was concerned. By the 1970s, doubts had begun to set in about the safety of those rickety swing-sets and perilously high slides. Several high-profile injuries prompted parental worries, and the resulting lawsuits struck fear into the hearts of municipal planners as well. One consumer advocate at the time compared playgrounds to a game of Russian roulette. When the first public playground guidelines from the Consumer Product Safety Commission arrived in the early 1980s, the classic playground’s fate was sealed. By the 1990s, the height and size of new equipment shrank, climbing opportunities disappeared, and guardrails were installed everywhere imaginable. “There’s not as much that’s challenging,” said Colorado photographer Brenda Biondo, whose photographs of classic American playgrounds form the basis of a nostalgic forthcoming book titled “Once Upon a Playground.” “They’re taking out swings in a lot of places, which is really sad.” Biondo’s book documents now-vanished implements like “stationary jingle-rings” and “giant waves,” plus tall slides and see-saws, prone to cracking kids on the head. Sand itself, the foundational element of those first playgrounds in Boston, fell victim to disability-access regulations and paranoia over junkies’ needles and general dirtiness. American playgrounds had become dull and homogenous, geared to toddlers more than athletic older kids and dominated by uniform models from catalogs. In her introduction to Biondo’s book of photographs, Solomon calls playgrounds “microcosms of the values and interests of a country at a particular time.” Playgrounds have always been sites for adults to impose their ideas about what they think children need. From the very beginning, reformers installed them to keep children safe from the streets, and to offer opportunities for physical vigor and moral development. If the conventional wisdom is that 21st-century American children have been coddled into abject fragility, advocates suggest great playground design can help revive them. 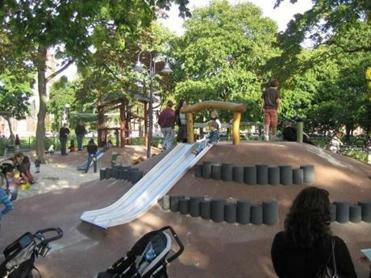 Some child development experts now advocate for playgrounds incorporating “loose parts,” like those at the Alexander W. Kemp Playground at Cambridge Common. 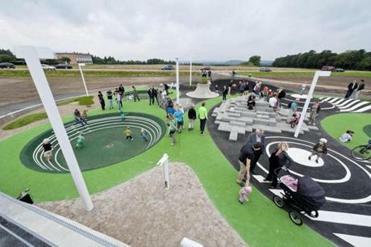 So what do playgrounds of the future look like? One common source of inspiration—and one beloved of advocates of more risk in childhood—is the European idea of “adventure playgrounds,” which give children random objects like wood, hammers, and nails to let them build and explore. The Atlantic’s Hanna Rosin visits ones in Wales where children light fires in tin drums and jump on dirty mattresses. But designs that wild have never really taken off in the United States, in part because their appearance is cluttered, and in part because they require a paid supervisor. These days, sand is prized by child development experts who advocate for playgrounds incorporating “loose parts,” which allow for a wider range of play than fixed implements. “When sand became this big perceived risk, it just disappeared from the playground,” Johnson said. “But it’s coming back.” One of best examples so far, she said, is Alexander W. Kemp Playground on Cambridge Common, which was renovated in 2009 to include a sand pit and water pumps. Its new iteration imitates a natural landscape, including hills, valleys, and plants, and it includes a favorite feature of the risk-within-reason crowd: slides built into hills, so children get the thrill of speed without the risk of a serious fall. One small way that American cities are breaking play out of the playground model is by installing “playable” works of public art, which are not designated only for children, but which children are drawn to. Gabriela Burkhalter, who curated an exhibit on playgrounds that closed this month at the Carnegie Museum of Art in Pittsburgh, mentions Anish Kapoor’s sculpture in Chicago’s Millennium Park, a huge shiny blob informally known as “The Bean.” “It’s not a playground,” Burkhalter said, “but families have a lot of fun going there.” Sculptures encourage creative interaction between all generations, rather than prescriptive child-only activities—and they are also a way of pulling top artists back into thinking about play. Not all opportunities for play, in other words, need to be look like playgrounds. They don’t necessarily need to be permanent, expensive, or complicated. As Johnson puts it, “We ought to have play that comes and goes. We ought to dump some sand piles in the summer.” What people thought children wanted in the 1880s, it turns out, might be the same thing they want today.